”The Conclusion.” Of the series? Apparently, since it and Hal Jordan and the Green Lantern Corps are being re-launched as The Green Lantern. Which I presume means the other GLs will be pushed back into supporting roles. 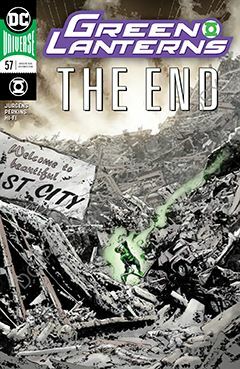 Though the future plans for Jessica Cruz are vague and ill-defined, so maybe DC Comics has bigger plans for her. The story starts of with a bang, as Cyborg-Super-Lantern flash fries a mother and child on the streets of Coast City. Intending to blast the place into smithereens (again), he can only be stopped by Hal Jordan and his new-and-improved power ring. But since Cyborg-Super-Lantern has the power of Superman as well, will Hal have the will power to defeat him? With the end of the story, this also marks the end of Mike Perkins artwork. I’m sure there is a title out there suitable for his style of rendering – or in this case, scanning photos of cities and using them for backgrounds. As for his figures and faces, on this particular book, it looks like a high school kid imitating Neal Adams. I should know; I WAS that high school kid. But he’s working in comics and I’m not, so your mileage may vary. On one hand, there is no extended epilogue, which I often find to be overly drawn out. On the other hand, with so many story elements involved, perhaps this issue needed it. It seemed a wee bit abbreviated at the end.